Space Safety » Archive » Space Exploration » Asteroid Mining » NASA to White House: May I Bring My Asteroid Home? 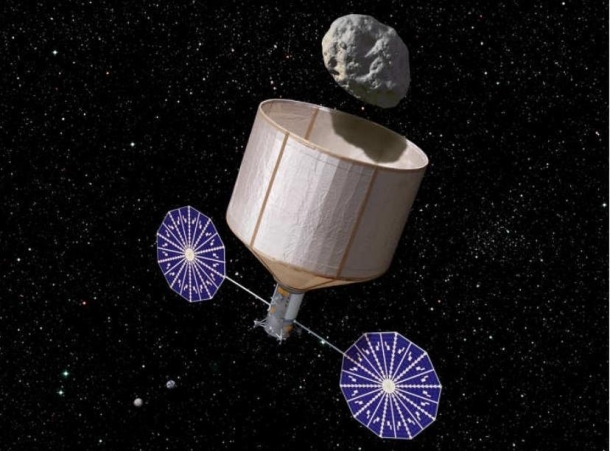 Depiction of a robotic asteroid capture vessel (Credits: Rick Sternbach/Keck Institute for Space Studies). Not long after the US Presidential administration flatly denied approving a mission to establish a space station in the second Earth-Moon Lagrange point that NASA sources had been talking up, rumor has it that the White House is considering an even more outlandish-sounding mission: bagging an asteroid and dragging it into lunar orbit. The weeks since the US presidential election have been somewhat bruising for NASA. Instead of a calm continuance of the known following reelection of President Barack Obama as could’ve been reasonably expected with the election of an incumbent, the agency has faced sharp criticism and appeared to have a public misunderstanding with the administration over its next steps. In a move that would appear to bolster the administration’s goal of asteroid travel over the abandoned lunar travel of Constellation, the White House is said to be considering a plan worked out in the spring of 2012 to visit an asteroid, encase it in a drawstring bag, and drag it to lunar orbit for leisurely study. NASA conducted a feasibility study of the mission in concert with the Keck Institute for Space Studies of the California Institute of Technology. Their goal was to figure out the best way to capture an asteroid. Their proposed mission calls for launch of an asteroid capture capsule aboard an Atlas V rocket. The capture capsule would deploy a 17 m diameter bag when in the vicinity of the asteroid, securing the rock using drawstrings. The capsule would then propel itself and its cargo into lunar orbit, a safe place from which to study the object without worrying about potential collisions with satellites or atmospheric entries. Although it sounds bizarre, the feasibility group considered any number of ways to transport an asteroid and found all of them wanting save the bag approach. The problem is, it’s difficult to ascertain the physical properties of an asteroid in advance of a close-up study. Many asteroids are composed of loose rubble lightly held together gravitationally, but easily broken up with any application of force. Such an asteroid would be unable to withstand thrusters implanted in its surface or other mobilization techniques. Such a mission, possible within 10-12 years according to NASA, would be the first time a celestial object is captured and oculd lead to developments in propulsion. It would also necessitate a broad survey of candidate asteroids, something that jives well with commercial interests in asteroidal resources. Will the asteroid be kept at a LaGrange point, or will it be a subsatellite ? The Keck feasibility study offers the option to keep it in either high lunar orbit on in a Lagrangian halo orbit. Which one NASA would choose or has recommended I do not know; they may not have figured that out yet.